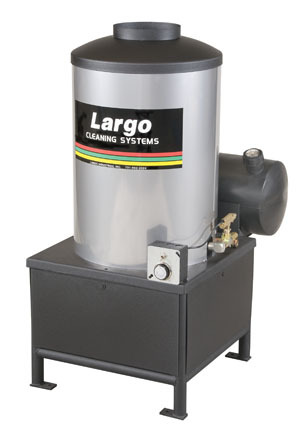 Largo Hot Boxes are designed for many different uses and applications. A hot box is actually a water heater much like the heating coil of a pressure washer. It is widely used to do just that. Attach a cold water pressure washer to it and you’ve got a hot water washer. While this is the common use of our hot box, we do like to let you know of other uses to consider. Many of our larger heaters are used in concrete plants to heat/mix water. Some of our units with stainless coils are used in boring operations in frozen earth, on diving platforms to heat water for diver suits and as industrial water heaters in manufacturing plants. They work well in these applications because they can produce continuous, on demand hot water with a controlled temperature. 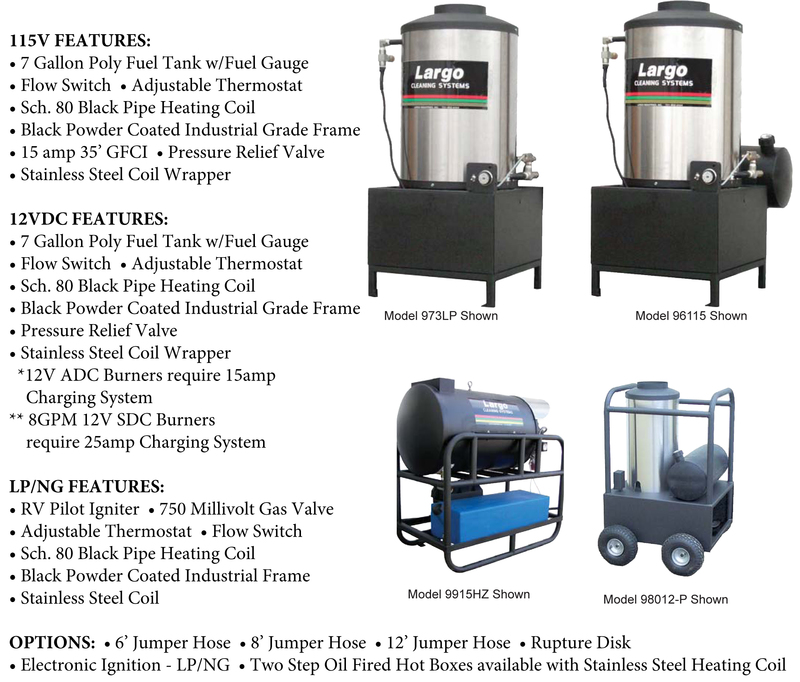 Oil fired (kerosene home heating oil and diesel) require a power source: 115 Volt AC Burner, (united have 15amp GFCI w/35ft power cord) or 12Volt DC burner which requires a battery connected to an engine that produces enough amperage to keep the battery charged. Natural gas fired heaters (NG) are always used as a stationary heater. These are available with an electronic ignition option for continuous use applications or our standard millivolt standing pilot system for intermittent use. Liquid propane (LP) fired heaters may be used as a stationary heater like the natural gas system, available with either a standard millivolt standing pilot or an electronic ignition option. They may also be installed in some portable applications. These hot boxes are not designed to be installed on open trailers or trucks. Proper installation is required. Consult a NG/LP specialist in determining tank sizes, installation procedures and local code requirements. Customer Pays Shipping. No further discounts apply including Bonus Bucks.